Protesters march through Valletta in September in memory of women killed by partners or relatives in Malta. File photo: Chris Sant Fournier. 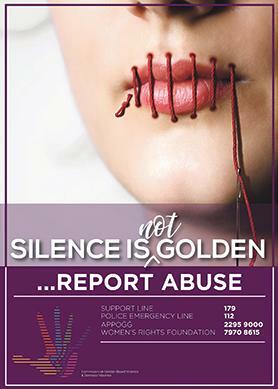 Silence was not an option so report any abuse, the Ministry of European Affairs and Equality said on Sunday, on the occasion of the International Day for the Elimination of Violence against Women. 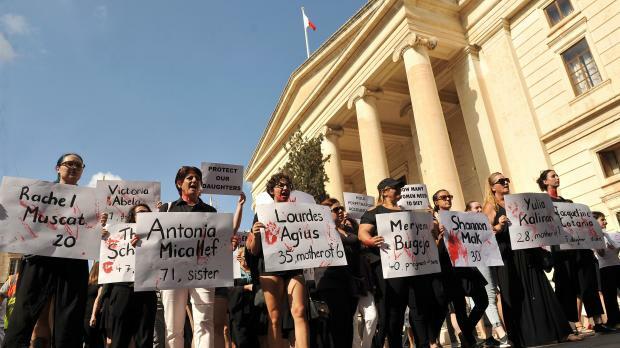 Scores of protesters marched in Valletta earlier this year in tribute to women killed by partners or relatives in Malta. Participants, some of whom sporting symbolic blood-stained necks, carried the names of 32 women and girls killed in the last 20 years by their partners, children and other relatives. The silent march was held after Lourdes Agius, 35, was found dead in her bedroom in Paola. Her partner was charged with her murder. The authorities are holding 16 days of activism against domestic and gender-based violence. The programme started on November 23 and will be include a series of activities, including seminars and a solidarity walk. A culture and mentality of tolerance for domestic and gender-based violence persisted notwithstanding legislative efforts made in a bid to ensure enforcement agents would have powerful tools at their disposal to protect victims, the Equality Ministry said. The government alone would not be able to overcome the challenge and everyone needed to stand up to it, empathise with victims and encourage them to report violence, the ministry said. It was important to note violence assumed different forms, it added. The message was clear: one should not remain in an abusive relationship because the law was there to offer its protection. Statistics show that only one out of six victims in Malta reports abuse. Most women in the European Union, who are abused by their partners, do not call the police and only one in three who is physically or sexually abused contacts the authorities. In Malta, the situation is even worse, with data showing that while 12 per cent of women have been victims of intimate partner violence, only 14 per cent of them filed a report.